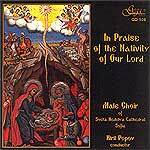 The present release includes 23 Orthodox chants and spiritual songs dedicated to the Feast of the Nativity, performed by the male choir of Sveta Nedelya Cathedral in Sofia, conducted by Kiril Popov. Soloists are Kostadin Yanchin, Peter Yanakov, Ivan Ivanov, Dimitar Bonev, Stoyan Malinov and Kiril Didov. Besides the polyphonic choral tradition there exists another, monophonic tradition. It is called Eastern Church Chant and has been used in Bulgaria for over a thousand years. The present release contains three chants of these. 1 Troparion for the Nativity 0'58"
2 Kontakion fro the Nativity 2'16"
3 O Gladsome Radiance 2'48"
4 Exaltation for the Nativity 2'36"
5 Shout Joyfully to God 3'15"
6 Christ is born 2'11"
7 Great Prokeimenon „What God is there like Our God?” 2'24"
8 Glory to God in the Highest 5'28"
9 As many as are Baptized into Christ 5'38"
10 From Canon fro the Nativity 1'50"
11 Anti Axion Esti Sung at the Nativity 3'15"
12 Axaposteilaron Sung at the Nativity 1'25"
13 In Praise of the Nativity 5'01"
14 The birth of Christ 2'03"
15 Silent night, holy night 3'15"
16 New Joy Has Come 2'35"
22 The many Years Prayer 2'01"